Abdominal pain can result from direct impact or trauma to the stomach. Or it could be gastrointestinal related with abdominal cramps, nausea, diarrhea, and vomiting. The following are all possible injuries or complications which can be caused by a direct impact or trauma to the abdomen. Being winded refers to what happens when you are subjected to a sudden forceful impact to the abdomen, and is very common in contact sports like rugby. This causes breathing difficulties and is often described as having the wind knocked out of you. The symptoms usually pass in 10-15 minutes as the diaphragm relaxes and recovers from the blow. Being winded is caused by a sudden blow or impact to the stomach or sometimes from a fall onto the back. The athlete will have difficulty breathing deeply and possibly difficulty breathing at all. They will often be anxious or panicking about the inability to breathe. What happens when you get winded? Specifically, a blow to this area which results in a winding causes compression of the nerves behind the stomach – the solar plexus. This causes the diaphragm to contract and go into spasm, which makes it difficult to breathe in and out properly. Once the diaphragm relaxes, breathing becomes easier. Being winded is most common in contact sports such as Rugby and may also happen in ball sports such as soccer or where the athlete falls to the floor such as in martial arts. Treatment: Sit in a crouched position as this helps the muscles to relax. Try to stay calm and take slow deep breaths. The condition should improve within 10-15 minutes. If not, seek medical attention in case of further injury such as a fractured rib or collapsed lung. Bruised abs (or an abdominal muscle contusion) occur after a direct trauma or impact to the stomach muscles. This may be from a hard object such as a ball or racket, or in an accident such as a fall which causes bleeding into the muscles. The area will be painful and tender and the muscles will often feel tight. Symptoms will include pain on impact with tenderness in the stomach muscles. Bruising may appear and contracting or stretching the stomach muscles will be painful. The patient may have a feeling of tightness in the muscles. Treatment: In most cases, bruised abdominals do not require medical attention, just as other muscle bruises do not. Rest from aggravating activities. Apply ice to ease pain and reduce bleeding and swelling. A doctor may prescribe anti-inflammatory medication to ease pain and swelling. The bruising will usually clear within a week to 10 days. If symptoms persist, seek medical attention. If you are concerned over the severity of your symptoms, seek medical attention. Watch out for symptoms such as blood in the urine. An abdominal strain is a tear or rupture of part of the abdominal muscles, usually at the point where it attaches to the pelvis. Immediate severe pain in the abdominal muscles is a sign of a rupture, and the pain will exacerbate when the muscles contract. The strain can be caused by participation in sports such as pole vault, gymnastics, and rowing that use the whole body. A bruised bladder, also known as a contusion, is normally caused by a direct impact to the lower abdomen. This may occur following a fall, car accident or being hit with a blunt object. As well as feeling immediate pain, feeling nauseous and blood in the urine are other signs of this injury. Medical attention will be needed to judge and monitor the extent of the damage. 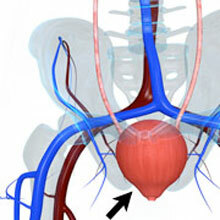 Symptoms of a bruised bladder include sudden pain on impact. Pain in the lower stomach. Tenderness in the abdomen. Nausea. Blood from the urethra. Blood in the urine. Treatment: Seek medical attention immediately. A doctor will assess the patient and may order investigations such as CT scans or ultrasounds to view the extent of the damage and check there is no internal bleeding or leaking from the bladder. An X-ray may also be requested to rule out pelvic fractures. Bruising with no other injuries will usually clear on its own within a week or so. A hospital stay may be required to monitor symptoms until the doctor is sure there is no internal bleeding or rupture of the bladder. A bruised liver or a liver contusion occurs after a direct impact to the torso, resulting in bleeding within the organ. Car accidents are the most common cause of this injury. The pain will be severe and immediate, and there may be a referred pain in the right shoulder. Medical attention will be needed immediately to assess and monitor damage. Symptoms of a Bruised Liver: Sudden pain on impact. Pain and tenderness in the upper right of the abdomen. Referred pain into the right shoulder. Nausea. In severe injuries when a lot of blood is lost, the patient could develop shock and possibly lose consciousness. Severe injuries could actually be a laceration (tear) of the liver. Treatment of a liver contusion: Seek medical attention immediately. Your doctor will examine you and may perform an ultrasound or CT scan to assess the damage. If the injury is just a contusion with no tearing then close observation is recommended for several days. Blood tests will be repeated daily to check for blood loss. The CT scan or ultrasound may also be repeated after a few days to check the liver is healing and there has been no bleeding. Contusions tend to be relatively mild injuries which heal within a week or so. A bruised kidney (or kidney contusion) occurs following a direct impact on the lower back area. This is most commonly from car accidents, although may also result from a fall or a physical attack, such as being kicked in the back. The impact will cause immediate pain which will need to be medically examined straight away and monitored over a few days. Symptoms of a kidney contusion may include instant pain in the lower back area, usually on one side, nausea, vomiting, blood in the urine and muscle spasms in the back. If you suspect a kidney contusion seek medical attention immediately. A doctor will examine the patient and may request An X-ray to check for associated injuries such as fractured ribs. Other tests such as MRI’s or CT scans may also be ordered to check for internal bleeding. In cases of a simple kidney contusion, the patient is usually monitored closely for a few days. The kidney will usually heal on its own without further complications within a week or so. A kidney laceration (or rupture) occurs following a blunt impact to the lower back region, whether it’s a fall or a physical attack. The extent of the injury can vary considerably and mild damage may not demonstrate many symptoms. Whether the damage is mild or severe, it is important to continually assess for deterioration in the condition. Symptoms can vary and mild damage may initially show no symptoms. Usually, the abdomen will be painful on palpation. Blood in the urine. Nausea or vomiting. Changes in blood pressure and pulse. Shock which may lead to unconsciousness. It is usually caused by impacts to the abdomen, especially the lower back area. Falls, car accidents and physical attacks are the most common causes. A CT scan to view the kidneys. An Aortogram. This is where a special dye is injected into the main artery (the aorta). X-rays are then taken of the area as the blood containing the dye travels through the kidneys. A leak can be seen clearly here. Treatment depends on the extent of the damage. Minor lacerations may only require observation to check that the kidney is still functioning efficiently. In more serious cases, surgery may be required. The aim of surgery is to stop bleeding and to preserve the kidney tissues and function. A bruised spleen (or spleen contusion) is bruising to the spleen which occurs after a direct impact to the upper left abdomen. It may occur after a fall or a car accident. It is not as severe an injury as a spleen laceration (or rupture). Symptoms include immediate pain on the left side of the body and nausea, but a worsening of the person’s condition can signify something more severe. Symptoms of a bruised spleen include instant pain on impact. Pain is located on the left side of the abdomen. Pain may also be referred to the left shoulder or arm. Nausea. Tenderness in the area. Watch out for more severe symptoms such as changes in blood pressure, heart rate, confusion and loss of consciousness which indicate a more serious injury. Treatment: Seek medical attention immediately. A doctor will carry out an examination and may require further investigations such as ultrasound or CT scans to determine the extent of the injury and if there is any internal bleeding (see ruptured spleen). Most spleen contusions will heal successfully on their own, provided there are no other complications. Rest and observation should be undertaken and a hospital stay is usually advised so you can be closely monitored. Bleeding from the spleen may not be picked up initially so further tests are usually carried out after a day or two to confirm that it is just a contusion. A ruptured spleen may occur following a direct blow to the left side of the stomach or back. This will often be from road accidents, contact sports, or physical fights. The impact tears the lining of the spleen and the tissues inside which can make the abdomen painful. Medical help will be needed as it causes internal bleeding. Treatment: Medical attention should be sought immediately as internal bleeding can be fatal. The patient will be put on a drip to maintain circulation to the organs. A blood transfusion may be given to replace lost blood. Surgery is required to stop the bleeding. Usually, the entire spleen will be removed in an operation called a splenectomy. Occasionally, when the tear is only small, the surgeon may be able to fix the tear. If the spleen is removed, it is important that the patient has an injection to vaccinate them against pneumococcal infection as the spleen plays a large role in protecting the body against infection, especially from the pneumococcal bacteria. Gastrointestinal (stomach and intestine) problems during exercise (especially high-intensity exercise) are frequent. The Symptom may include heartburn, belching, abdominal cramps, nausea, diarrhea, vomiting and an urge to defecate. There are a number of causes including Peptic ulcer, peritonitis, or simply a virus or infection. Read more on gastrointestinal symptoms. Symptoms include Severe pain in the back or side of the abdomen. Pain is occasionally also felt in the groin. Pain may last for a few minutes, through to several hours and may be constant or intermittent. Nausea, burning sensation on going to the toilet, blood in the urine, cloudy urine and an urge to urinate more regularly are also kidney stone symptoms. Read more on kidney stones.